The parade has gotten huge (and expensive!) and we have had many requests for event T-shirts so we had some printed for 2013. The shirts were very popular and we sold almost all that we had printed. The T-shirts will become a regular part of the event. In mid-2012 a local oilman brought a lease request to the city to drill for oil downtown. In 2013 his request came up for the mandatory public comment period. He had the idea to drill a well from the field between McLean and Sycamore, under McLean and the river to beneath Century II. Obviously, the businesses and residents of Delano didn't think it was such a good idea. Neither did thousands of fellow Wichitans who visit Delano & Downtown. The situation did produce some interesting graphics (right) and allowed us to make some important contacts around the city. When Sedgwick County decommissioned and sold the Kansas Coliseum, they had to find a new home for the metal Longhorn statues. Ultimately, Maize High School got one of them and Delano got the other one. After almost 2 years of restoration and site preparation, "Longhorn on the Chisholm Trail" was installed in late summer of 2013. 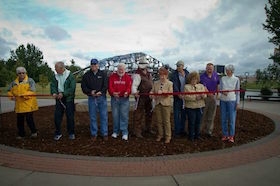 On Saturday, September 28th the City of Wichita held a Ribbon Cutting ceremony in Delano Park. 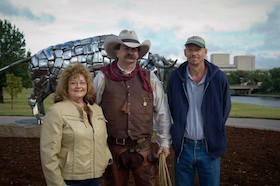 It was great to see our bull finally in place, even without the Tallgrass that will be planted around him! With plans for the new Delano Library and the River Vista / Delano Park development proceeding (as well as the Oil Drilling debacle) the Delano CDC Steering Committee was very active in 2013. The Steering Committee adopted By-Laws, elected Officers and incorporated as Delano United early in the year. 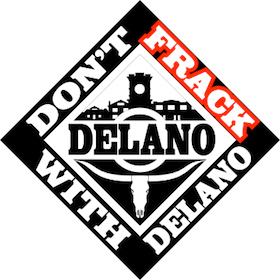 One of the the best things to come from all of this was a renewed sense of purpose for all of us involved in Delano. The various individuals and groups really did become Delano United. In our interactions throughout the year with the City and various people and groups around the city we were able to find many that share Delano's goals.